Lang large flat ratcheting box wrenches are designed for heavy duty equipment and industrial applications. Large flat ratcheting box wrenches from Lang are well known for their long life, ease of use, quality and accuracy. 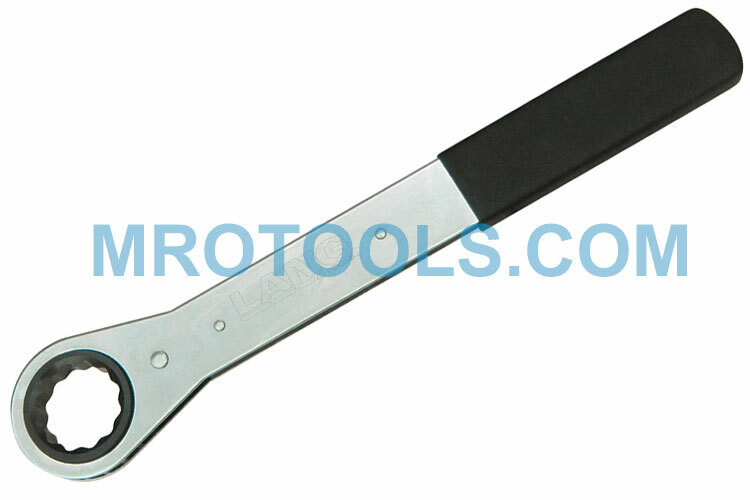 Lang large flat ratcheting box wrench handles are nickel-chrome plated for lasting quality and assurance. Lang large flat ratcheting box wrenches are built for those tough jobs where lots of torque, leverage & durability are required. Great for: Agricultural, construction, utility, mining, industrial equipment and much more! All Lang large ratcheting box wrenches utilize the ''torque grip system''. Openings are accurately broached for that perfect non-slip fit and critical parts are heat-treated to ensure safety and durability. The RB-46 Lang Flat Ratcheting Box Wrench 12 Point, Large, SAE is one of thousands of quality tooling products available from MRO Tools. Please browse Lang Flat Ratcheting Box Wrenches, Large for tools similar to the RB-46 Lang Flat Ratcheting Box Wrench 12 Point, Large, SAE. RB-46 Lang Flat Ratcheting Box Wrench 12 Point, Large, SAE description summary: Lang flat ratcheting box wrench 12 point, large, SAE. Socket Size: 1 7/16'' Point Size: 12 Width: 2 3/4'' Thickness: 5/8'' Overall Length: 15 1/2'' Quantity discounts may be available for the RB-46 Lang Flat Ratcheting Box Wrench 12 Point, Large, SAE. Please contact MRO Tools for details.